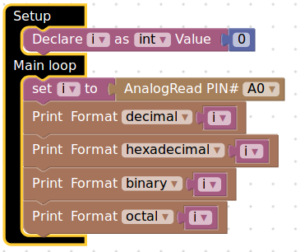 Example: reads an analog input on analog in 0, prints the value out. Prints data to the serial port as human-readable ASCII text followed by a carriage return character (ASCII 13, or ‘\r’) and a newline character (ASCII 10, or ‘\n’). To view the output text, the serial baud rate should be set to 9600. This is a choice of TUNIOT to make thing easier. Writes binary data to the serial port. This data is sent as a byte or series of bytes; to send the characters representing the digits of a number use the print function instead. Will return the number of bytes written, though reading that number is optional.